One thing we can all agree on is that the Gig economy has great branding. We all like gigs, cool and fun things. If your gigs are writing an article for the Times or speaking at the Cheltenham Literary Festival for 4 or 5 figure sums it probably does feel good to be a gig worker. But if your gig is unblocking somebody’s blocked toilet for £7.50 or working on a zero hours contract in the Sports Direct warehouse, probably not so cool. There are now 13.5 million workers in the UK who are either self-employed, part-time or temporary – 43% of the total workforce according to Andrew Haldane. Most of these workers are in low paid, insecure employment or LIMP. Limp economy is a better description than gig economy. The British economy as a whole is limping along with insufficient levels of productivity and investment and where stable long-term work is in short supply. The Gig economy is presented in some quarters as a new and positive way for work to be organised. But you do not have to use a very long historical lens to see my Grandfather lining up at Greenwich Docks at six in the morning to see if there is any work that day. This system, known as the ‘Lump’ was not abolished until 1947. It was still the case that in the 1930s that 25% of the female workforce were maids, who were excluded from national insurance and many effectively self-employed. The post WW11 period saw an end to practices like the ‘Lump’ and the creation of stable employment for the masses. This period was notable for the coming together of the state, employers and trade unions to create a full employment economy with the welfare state as a safety net. It was not the nature of work itself that changed in this period, but the relationship of workers to their employers and to the state. It is the breakdown of this corporatist approach over the past decades that has impacted most on working conditions, along with the overall exhaustion of the UK economy. There is nothing inherent in the needs of a modern economy which should mean an end to stable long-term jobs. If you were working on a project to build the 300,000 new houses that are needed every year in the UK you would not be feeling insecure or having to work an Uber shift after work. If care homes were properly financed then care home workers could be properly paid and given secure jobs. The job of a taxi driver has not changed because of the introduction of Uber platform technology. Taxi drivers still sit in cars and drive people around. What has changed is that it has become more insecure and exploitative, there is a loss of control of the job when compared with black cab drivers. The gig economy often reflects a change in the balance of power between employer and worker to the detriment of the latter, particularly in the private sector. The availability of cheap, flexible workers also discourages the kind of new investment that we need to increase productivity. This is not to deny that some people enjoy the flexibility of the gig economy and that is fine for them. But many more are forced into insecure employment because that is all that is available, or there are inadequate childcare facilities to allow them to work full-time. We should not be deluded into thinking that for many people who are trying to raise families, not knowing where the next pay is coming from is a good way to live. It is past time to turn the LIMP economy into a strong and growing one, with good jobs for all who want them. There are symbols of the past being torn down in John le Carré’s latest novel, A Legacy of Spies. But they are not statues; they are the secret agents of the Cold War between the West and the Soviet Union, which lasted until the fall of the Berlin Wall in 1989. Le Carré has revisited the plot of his early, brutal and furious novel, The Spy Who Came in from the Cold, in order to re-examine the morally ambiguous subterfuges that formed part of the West’s Cold War arsenal. Le Carré’s literary reputation has suffered over the years because he was pigeon-holed as a spy writer from very early on. Genre writers, however brilliant, are generally not deemed literary, which is particularly galling in le Carré’s case as he is one of the best British writers of modern times. The great American novelist Philip Roth described le Carré’s A Perfect Spy as the ‘best English novel since the war’. He is so much more than a writer of spy fiction. Through his novels, he paints the big picture of a Britain in decline since the Second World War. Le Carré should be more accurately described as a political writer, and yet one who deals with profound human emotions, indeed one who can make political history breathe through the lives of his characters. His themes are betrayal, deceit, loss and treachery; individuals and countries alike are the victims. Le Carre’s great literary creation is George Smiley, an officer high up in MI6. Smiley’s story is at the heart of A Legacy of Spies, although he himself only makes an appearance right at the end. A clever, ugly man, he is married to a society beauty who systematically betrays him, not only with many lovers but ultimately with a high-level Soviet agent. He is self-effacing, apparently humane and yet utterly ruthless. Smiley is the embodiment of the postwar British establishment in its quest for new certainties. Yet the probity of the ruling class is in constant doubt as the ghosts of real-life upper-class traitors Burgess, Maclean and Philby are ever present, leading the protagonists of the novel to ask, ‘who can you trust?’. The answer is almost nobody. Like all le Carré’s novels, the plot is complex. (I would recommend reading, or rereading, The Spy Who Came in from the Cold before A Legacy of Spies, as the plots of the two novels are intertwined and interdependent.) Through the eyes of one of Smiley’s associates, Peter Guillam, we discover what laid the basis for the tragic events of the first novel, and how they were justified at the time. Le Carré’s well-known opposition to Brexit has led him to rewrite history, to create a fiction in just as fictional a way as the characters who want to rewrite the Cold War activities that killed their parents. A Legacy of Spies reflects the uncertainty and lack of purpose that has existed at the heart of the British establishment since the end of the Cold War. It cannot, in the end, fully defend the past because it has lost confidence in its own history and itself. For le Carré and others, ‘Europe’ may now be the cause, but if there is a Europe worth defending it won’t be found in the post-Cold War institution of the European Union. Rather, it is to be found in that which Smiley has now abandoned, the old age of reason, and the principles of freedom, sovereignty and democracy. I wrote to you asking for your support in triggering Article 50 and carrying out the democratic will of the people (as promised in the leaflet that the government sent out prior to the election, see below). Your reply , which I have published on my blog, indicated that you do not accept the result and would be calling for the referendum result to be overturned. 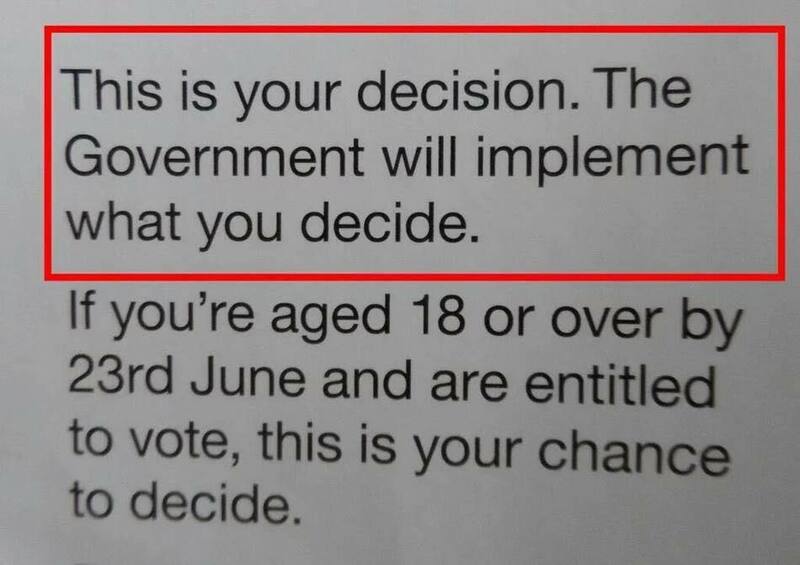 I am not sure how the government’s promise to implement the result could be misinterpreted, but I have reproduced it here in case you had a problem reading it at the time. I may have missed your argument prior to the referendum that the result would not be binding, so please forward it to me if it exists. I wrote to my MP asking for her support for triggering Article 50 immediately. This was her response. We should make it clear to her and others that we are not prepared to allow this attempt to overthrow democracy to go unchallenged. Thank you for contacting me in relation to the EU referendum. I have always been passionately pro-European, and I campaigned very hard for the Remain campaign both in my constituency and elsewhere in the months leading up to the referendum. Whilst I don’t believe that the EU is perfect, I am absolutely certain that we are better off remaining within it and working from within to make it fit for purpose for the 21st century. I am proud that this support is shared by so many local residents in Dulwich and West Norwood and that Lambeth and Southwark voted overwhelmingly in favour of remaining in the EU on 23rd June. I share the devastation that many residents feel about the referendum result. I have received many hundreds of emails from local residents who have signed the petition for a second EU referendum, or who are requesting that Parliament votes to reject the referendum result. The referendum result was extremely narrow and within a day of the result being announced it became clear that the key promises made by the Leave campaign were, quite frankly, completely dishonest. This is a pattern of behaviour we have come to expect from Boris Johnson in his former role as Mayor of London where he presided over the decimation of London’s police service, and repeatedly failed to tackle London’s housing crisis. UKIP leader Nigel Farage has admitted that it was ‘a mistake’ to promise £350million extra funding per week for the NHS as a consequence of Brexit, and former Tory leader Ian Duncan-Smith now claims that he never supported this pledge despite being photographed almost daily in front of the Leave campaign bus emblazoned with this slogan. Conservative MEP Daniel Hannan, key architect of the Leave campaign has said that he has no intention of limiting the numbers of EU migrants coming to the UK because the UK will have to accept the free movement of workers in order to remain within the European Single Market, in complete contrast to the claims made during the Referendum campaign that leaving the EU was the only way to reduce migration. Large numbers of people voted Leave on the basis of these claims and it has become very clear that they have been deliberately misled. I strongly believe that 16 and 17 year olds should be able to vote in UK elections and should have had their say on proposals that will impact on them more than any other generation. The blatant dishonesty of the Leave campaign, combined with the closeness of the result and the exclusion of 16 and 17 year olds from the ballot, to my mind create a very strong case for a second referendum. This second vote should give electors aged 16 and above the final say in accepting or rejecting a detailed proposal on the terms under which the UK would leave the European Union, a decision the consequences of which would reverberate for decades. Electors should know in detail what the UK’s economic relationship with the EU would be, what the approach to immigration would be and what the impacts on our ability to travel to EU countries would be etc. I will do everything possible to ensure that Parliament explores this possibility to its fullest extent and would of course once again strongly campaign against these proposals to leave the European Union. I will always vote on this matter in a way which represents the overwhelming view of my constituents that we should remain in the EU, but it is worth noting that there were many more constituencies that voted Leave, than voted Remain. I do not think that it is realistic to expect the majority of MPs to vote against the referendum result that their own constituencies delivered. This is one of the reasons that I believe a second referendum is our best chance of remaining in the EU. I have signed Early Day Motion 243 (http://www.parliament.uk/edm/2016-17/243) which calls for a second referendum, and I hope that this will reach the required threshold of support for it to be debated in Parliament. Over the coming months I will continue to represent the overwhelming view of my constituents that the UK should remain in the EU. The post referendum campaign to remain in the EU is now fully under way. Those who never wanted us to Remain have now been joined by some of the people who voted Leave, but who are genuinely and understandably concerned about what we should do next. These latter people, who I would call ‘Soft Leavers’, are arguing for delaying the invocation of article 50 for as long as possible or as long as necessary. They are in many cases joining forces with those who did not want us to leave in the first place-the ‘Hard Remainers’ to find reasons why we should delay leaving the EU until some mainly unspecified date in the future. The main reasons that the Soft Leavers are giving for waiting are along the following lines. 1. We need time to work out our bargaining position with the EU. 2. If we wait, the EU is well on the way to imploding after the French and German elections next year. 3. There is a split between the EU Commission and the national governments in Europe which we can exploit, even to the extent of bypassing the EU Commission and making deals with individual countries. 4. If we can get the EU to back down and make concessions on the free movement of labour it may not be necessary to leave the EU at all. This is where the Soft Leavers join with the Remainers. The problem with all these arguments, whatever their individual tactical merits, is that they fail to take into account that the consequence of delaying the invocation of Article 50 immediately will be to strengthen the hand of those who wish to deny the democratic decision of the majority of the people. This would be a terrible blow to our democratic process and induce even more cynicism in those who have already demonstrated their alienation from the political establishment. It is far more important that we strengthen our democracy and the people’s belief in it than the specifics of a negotiating process. In 20 years time the EU negotiations will be history and the world economy will be in a different place, but if we abandon democracy now we run the risk of damaging the democratic process for good. 1. We need government action to stimulate the economy. The economy is weak and has needed attention for years. Remainers will try to pretend that the problems have been caused by Brexit and this will demoralise Leavers if there is a recession.The government should borrow money and invest in a major house-building and infrastructure investment programme. It should also find ways to stimulate technological and scientific investment. Existing plans to build a third runway and HS2 should be accelerated. 2. We should start making new trade deals with the rest of the world outside of the EU. We should campaign for the invocation of Article 50 immediately under the banner of Democracy Now. The best bet for the UK is not to rely on the kindness of others, but to take matters into our own hands and make our democracy work. On re-reading American Pastoral I was struck by how much more important it is even than when it was first published nearly twenty years ago. It is a, if not the, great American novel. It is a profound examination of the human condition and it is also, crucially in the modern context, a critique of the sixties and the rise of the Me generation. Roth should have won the Nobel Prize for literature for this and the two other novels in his late, great trilogy about America, the Human Stain and I Married a Communist. He is head and shoulders above virtually all the winners in the past 30 years. Set mainly in the late 1960s, this book charts the rise, decline and fall of Seymour Levov, a Jewish boy known as the Swede because of his blond hair, who aspires to live the American Dream. A football player, ex-marine and successful businessman, he is idolised by his peers and marries a gentile beauty queen. The Swede is a man who, like the immigrant in the film of the Godfather ‘believes in America’. His American Pastoral means raising his family in an idyllic country retreat. He gives up his Jewishness in order to assimilate into the white Anglo-Saxon protestant ascendancy. The Swede’s tragic decline stems from the troubled relationship he has with his daughter, Merry. Roth turns this family dysfunction into a study of; the decline of America as a global power, the hollowness of the American Dream, the hypocrisies of the bourgeois family, the coming undone of the American immigrant melting pot, the decline of the US as a manufacturing nation and the rise of narcissism. The genius of the novel is that it brings all of these themes into focus through dissecting the central relationship between the Swede and Merry. And while it would be hard to call the book funny, it is full of ironic twists and turns. The last hundred pages are a dinner party from hell. Roth looks at the sixties, not as the period of liberation for women, gay equality or third world liberation which formed baby boomers like me, but from the other side, not as freedom, but as the death of decency and the American way, and the birth of the Me generation. Roth shows how the pre sixties parents, the Swede included, lost faith in their own beliefs and encouraged the 60s generation to rebel. The Swede’s pastoral idyll is exploded by the Vietnam War, the moment when the US lost its way, which fuels Merry’s rage against the whole of traditional America, and especially her own family. Merry sets off a lethal bomb and disappears into the underground subculture of the Weatherman. The Swede’s tribulations reflect the agony of American parents in the sixties when they discovered, in Dylan’s words, that their sons and their daughters were beyond their command. This novel is both timeless and timely, old testament in scope yet also showing how we got from the Me generation to the You Must Not Offend Me generation. At the end, despite everything, Roth insists that the Swede was right to pursue the American dream, of freedom, aspiration and integration. We can all agree with this, because, in the words of the song, ‘you gotta have a dream if you don’t have a dream, how you gonna have a dream come true’.